Every year by the time my birthday arrives I am over cake and eating in general, not because I don't like food, but because I just can't eat anymore. You see my birthday falls exactly 2 weeks after Christmas and a lot happens in those two weeks food wise. We start on Christmas Eve, then there's Christmas Day, loads of leftovers on Boxing Day and the day after, have a few days off before New Years Eve, followed by New Years Day, again loads of leftovers after New Years Day. Then my sons birthday is a few days later, prepare for a family gathering, bake his cake, eat leftovers the day after his birthday and bake myself a cake also as the next day it is my birthday. So on my 39th birthday my 11 year old daughter said she will make me a cake. 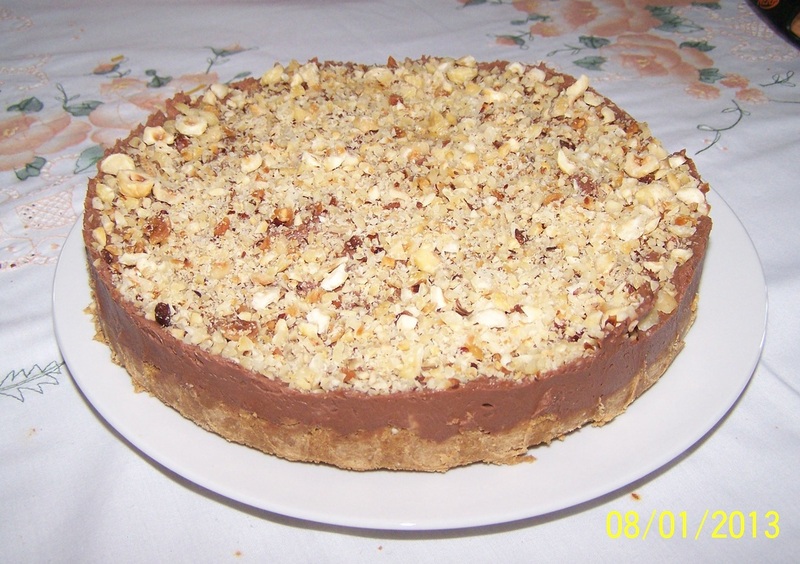 She had some help from my nieces who were staying over, and together they made this Nutella Cheesecake. It was delicious, creamy, smooth, rich, beautiful. I enjoyed every bite. It is a really easy cheesecake to make, and honestly if you love nutella, you really should make it. Eat it straight out of the fridge, don't leave it out, it tastes better fridge cold. If you can't find toasted chopped hazelnuts in you supermarkets, just buy whole ones, then roast and chop yourself. Preheat you oven to 180C. Place the hazelnuts in a single layer on an oven tray. Bake for 10 minutes or until aromatic and lightly toasted. Place a teatowel on a flat surface, put the hazelnuts in the centre of the teatowel, wrap the hazelnuts up and gently rub them together, their skins will come off. Then to chop them, blitz in a food processor or chop them with a knife. The cream cheese needs to be at room temperature before you using it for this recipe, place in a bowl chopped up for 1 hour, then beat once softened. The biscuit base: Place the biscuits in a food processor, add the butter and 1 x 15ml tablespoon of the nutella, blitz until the mixture starts to clump. Add 25g of the toasted hazelnuts, continue to pulse until you have a damp, sandy mixture. Line the base of a 22 or 23cm round springform tin with baking paper. Pour the biscuit mixture into your tin, and press it evenly into the base, using your hands, if it feels thick, press it up the sides of the tin a bit. Place it into the fridge to set while you make the filling. Use a free standing mixer her, it is easier, but you can do with a hand held one. Place the cream cheese and icing sugar in a large bowl of your mixer, beat until smooth and soft. Spoon all of the remaining nutella mixture into the cream cheese, beat until combined. Pour the nutella mixture over the cold biscuit base, smooth over the surface. Scatter over the remaining hazelnuts on top to cover. Place the cheesecake in the refrigerator for at least 6 hours or overnight. Take it out of the refrigerator just before serving. Carefully remove the sides from your springform tin. Leave it on the base. Slice with a cold knife (wipe the knife clean between slices) and serve immediately.